This page provides definitions of terms used throughout ICA-AtoM's system and user documentation. The about page provides general information on ICA-AtoM. It can be reached via the user menu in the top right-hand corner of the page. The content of the about page can be edited by administrators (see Manage static pages). An access point is "A name, term, keyword, phrase or code that may be used to search, identify and locate an archival description." (ISAD glossary). In ICA-AtoM, access points are derived from authority records and taxonomies created and customized by users. See Add/edit terms. Access privileges control the ways a user is able to interact with ICA-AtoM. For example, some users are able to add and edit content while others may only be able to search and browse content. Access privileges are based on defined user roles (see User roles). The "Add" menu allows authorized users to add new archival descriptions, authority records, archival institutions, terms, and functions. Only logged-in users can see the "Add" menu. The add new button is located in the button block of the view page and allows users to add new records (archival descriptions, authority records, archival institutions, and terms) to ICA-AtoM. The admin menu allows users with administrator access to customize ICA-AtoM to meet institution-specific requirements and to manage user accounts and user profiles (see Administer). 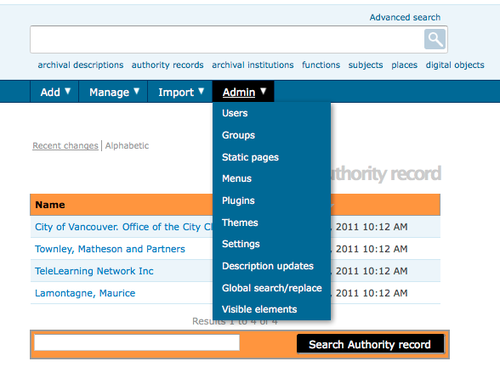 The Administration area is part of the resource description edit template. It allows the User to change the publication status of the resource - Draft (this resource description is not available for public viewing) and Published (this resource description is available for public viewing). The administrator is a type of user who has access privileges to do the following: install or uninstall ICA-AtoM; create, read, update, or delete any record; customize ICA-AtoM to institution-specific requirements; and manage user accounts and user profiles (see User roles and Administer). The advanced search is used to find descriptions in ICA-AtoM that contain text matching a search query. 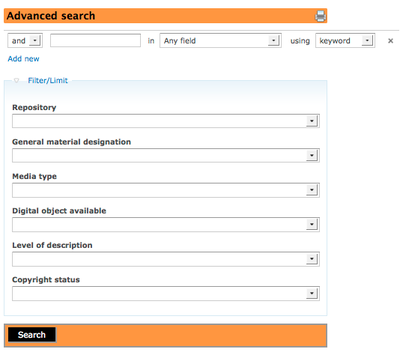 The advanced search hyperlink is located over the main search box on the ICA-AtoM home page. The user can select "and, or, not" operators, search term or phrase, and specific fields to create a powerful search query. The option to apply filters to limit or narrow the search are provided. The International Council on Archives (ICA) defines an archival description as "The creation of an accurate representation of a unit of description and its component parts, if any, by capturing, analyzing, organizing and recording information that serves to identify, manage, locate and explain archival materials and the context and records systems which produced it. This term also describes the products of the process" (ISAD glossary). In ICA-AtoM the data elements used for describing archival records are derived from the ICA's General International Standard Archival Description (ISAD). See Entity types and Add/edit archival descriptions. An archival institution is "An organization which keeps and preserves archival material and makes it accessible to the public" (ISDIAH glossary). 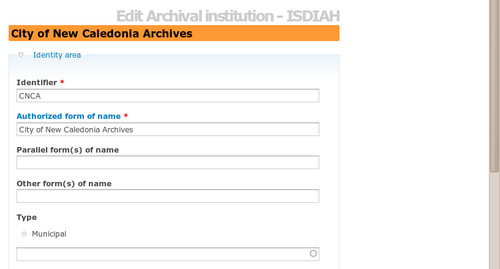 In ICA-AtoM the data elements used to describe such institutions are based on the ICA's International Standard for Describing Institutions with Archival Holdings (ISDIAH). See entity types and Add/edit archival institutions. Archival unit is a generic term for an aggregation of archival materials. A unit can be a fonds, series, file, item, or variation thereof, depending on institutional standards. A unit may be divided into sub-units for the purposes of description: e.g. a fonds may contain several series, each of which may contain several files, and so forth. The smallest (and therefore indivisible) unit is the item. The International Council on Archives (ICA) defines arrangement as "the intellectual and physical processes and results of analyzing and organizing documents in accordance with archival principles" (ISAD glossary). In ICA-AtoM, authority records are collections of information about actors - corporate bodies, persons, or families - who interact with archival materials, typically as creators. The data elements used to describe authority records are based on the ICA's International Standard Archival Authority Record for Corporate Bodies, Persons and Families (ISAAR). ISAAR defines authority record as "The authorized form of name combined with other information elements that identify and describe the named entity and may also point to other related authority records." See Entity types and Add/edit authority records. Browsing allows a user to see all records that have a certain type of access point (such as subject, name, or place) or other type of filter, such as media type or type of entity. In ICA-AtoM's default theme (the Caribou theme) the browse menu appears in a horizontal row below the search box; in the Alouette and Columbia themes the browse menu is displayed in a vertical box above and to the right of the search box. The button block allows authorized users to add, delete, move and duplicate content and to save or cancel changes made in the edit pages. Child record refers to a description of the archival unit that is one level of description lower than the current unit, e.g. if a series belongs to a fonds, the series is the child record of the fonds. In ISAD, a collection is "[a]n artificial assemblage of documents accumulated on the basis of some common characteristic without regard to the provenance of those documents. Not to be confused with an archival fonds." In the Canadian Rules for Archival Description, it is "[a] grouping of documents of any provenance intentionally assembled on the basis of some common characteristic." In Dublin Core, a collection is "[a]n aggregation of resources. A collection is described as a group; its parts may also be separately described." Column headers appear at the top of the lists on list pages and browse results and give the name of the field for whatever is being listed below. The context menu appears on all view and edit pages to show the current record's relationships to other records, with links, e.g. they show the hierarchical placement of archival descriptions within a fonds and the relationship between archival institutions, authority records, and archival holdings. See Context menu. In the context menu, logged-in users with permission can re-arrange child level descriptions (e.g., Series, Files, Items) within the Fonds treeview by simply dragging and dropping the selected resources. A contributor is a type of user who can search, browse, create, and edit descriptions. See User roles. A controlled vocabulary is a set of pre-defined, authorized terms grouped into taxonomies or entered into authority records and used for generating value lists and access points. See Add/edit terms. The International Council on Archives (ICA) defines a corporate body as "An organization or group of persons that is identified by a particular name and that acts, or may act, as an entity" (ISAD glossary). Similarly, in the Canadian Rules for Archival Description (RAD), a corporate body is defined as "an organization or association of persons that is identified by a particular name and that acts, or may act, as an entity. Typical examples of corporate bodies are societies, institutions, business firms, nonprofit enterprises, governments, government agencies, religious bodies, places of worship, and conferences." Cover flow show sets of thumbnails of digital objects and allows the user to scroll through the thumbnails using a mouse or keyboard scroll arrows. In ICA-AtoM a cover flow viewer appears in the context menu of archival descriptions whenever there are associated lower-level descriptions that have digital objects attached. The create button, located on the button block, is used to save new entities. Once an entity has been saved for the first time, the create button disappears and is replaced by the "Save" button, which is used to save all subsequent changes. A creator is "any entity (corporate body, family or person) that created, accumulated and/or maintained records in the conduct of personal or corporate activity" (ISAAR glossary). In ICA-AtoM, the creator is described in an authority record linked to an archival description, usually at the highest level of description only. Lower levels inherit the creator from the parent record, unless a different creator is specified. ICA-AtoM can accommodate multiple creators at all levels of description. See Context area. Refers to the language in which the user interface elements and database content are displayed. Users can switch between languages by using the language menu. Data elements, or elements of description, are ICA standards-based units of information applied to archival descriptions, authority records, archival institutions, and terms. The elements are entered into fields in ICA-AtoM's edit pages. Database content refers to information stored in ICA-Atom's database tables, including data elements, static page content, and user profile information. The deaccession record is used to indicate that a repository has removed an accession, in part or whole, from the collection. Instead of deleting an accession record, the repository will create a deaccession record that is kept. Default values for levels of description. These can be modified to suit institutional requirements. Default content is any database content that is included by default when ICA-AtoM is installed. This includes things like the default home page and drop-down menu values that are stored in taxonomies. The default language is the language in which all user interface elements are displayed when ICA-AtoM is opened. The language is specified when the application is installed. Users can switch to other supported languages and translators can translate database content and user interface elements. See Choose language and Translate. The delete button appears in the button block. Clicking on the delete button will prompt a warning to appear asking whether the user really intends to delete the entity. Delete icons are small buttons in edit pages used to delete values from multi-value fields, such as those containing event dates or access points. A developer is a programmer who is able to modify the underlying software code of an ICA-AtoM application. Digital objects are computer files that can be uploaded into and displayed by ICA-AtoM. They include scanned images, digital photographs, sound and moving image files, and other scanned or born-digital items. See Upload digital objects and File formats. The International Council on Archives (ICA), in the ISAD glossary, defines a document as "recorded information regardless of medium or characteristics. (See also Record)". The dialog that opens when adding donor contact information to the accession record or when selecting to edit an existing donor record. Donor records are located under the "Manage" tab in the menu. Donor records are only available to logged-in users with permissions. A draft record is an archival description that has not been published. All new and imported archival descriptions have draft status until the user changes that status to published in the gray box at the bottom of the archival description edit page. The Administrator can change the default publication status from draft to published in the Admin > Settings > Global > Default publication status. The publication status is inherited from the highest level of description. Users who are not authenticated cannot view draft records. 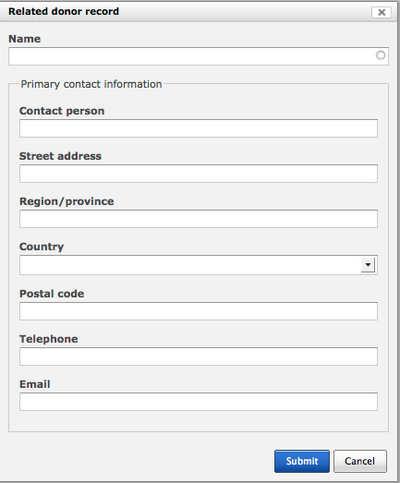 A drop-down list menu is a list of data-entry options that appears below certain fields in edit pages. Values are drawn from controlled-vocabulary terms, authority records, and default data contained in ICA-AtoM's database tables. The duplicate button appears at the bottom of the view page; clicking the button takes the user to the edit duplicate; this page is an edit page that is pre-populated with the existing data from the original record. The user can edit the duplicate record page and then save it as a new record. Some users use the duplicate function in ICA-AtoM like a record skeleton when doing large amounts of data-entry on similar records. The user can also switch between view and edit pages by clicking the title bar. The edit icon appears in edit pages next to fields that derive data from a related record. The user clicks the icon to edit the text in the related record, e.g. 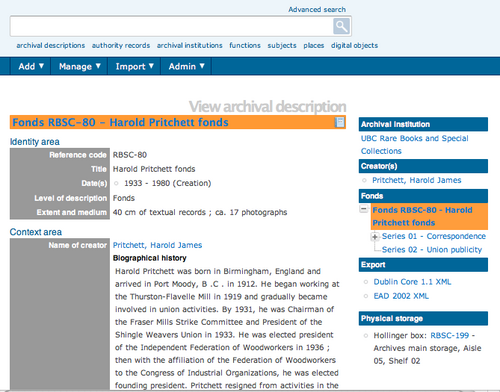 to edit the "Administrative/biographical history" in an archival description, the user must click the edit icon because the data resides in the creator's authority record. Edit mode allows the user to add, modify, or delete the contents of archival descriptions, authority records, archival institutions, terms, and other database content using edit pages. In edit mode, ICA-AtoM displays all fields in a record for data entry. Edit pages allow users to add, edit and delete the contents of archival descriptions, authority records, archival institutions, functions and terms. They are also used to carry out administrative functions such as changing user profiles and editing static pages. An editor is a type of user who can search, browse, add, edit and delete archival descriptions, authority records, archival institutions, functions and terms. See User roles. An entity is an object about which an information system collects data. From the user's perspective, in ICA-AtoM there are six main entities: archival descriptions, authority records, archival institutions, functions, rights records, and terms. See Entity types. An error message will display when ICA-AtoM is unable to execute an action. See error for examples of types of error messages. In ICA-AtoM, an event registers an action by an actor (corporate body, person, or family) at a particular time or over a span of time and may establish a relationship between the actor and other actors or entities. This is accomplished through the use of start and end dates in the context area of the archival description, which links the creator or other actor to the records for the period of time delimited by the dates. See Entity types and context area. A field is a container for a data element. Content is added to or modified in fields in edit pages. Field labels identify fields in view pages and edit pages. In ICA-AtoM 1.0-1.2, field labels can only be customized by developers working directly with the code. In ICA-AtoM 1.3 release, the Administrator can select certain field labels and hide them from public (unauthorized Users) views. See, Visible Elements. In ICA-AtoM the View archival description screen can be printed and printed and saved as a Finding Aid in pdf. The finding aid is a tool for discovering information about the fonds or collection. The creation of a finding aid provides the repository physical and intellectual control over the archival records. Fonds is an archival unit defined as "The whole of the records, regardless of form or medium, organically created and/or accumulated and used by a particular person, family, or corporate body in the course of that creator's activities and functions." (ISAD glossary). In ICA-AtoM, the fonds is by default the highest level of description. This default can be changed by administrators (see User interface labels). A function is a type of entity that describes activities linked to records creation, maintenance and use. Functions in ICA-AtoM are linked to archival descriptions, authority records and other functions. In ICA-AtoM the fields for describing functions are taken from the ICA's International Standard for Describing Functions (ISDF). See Entity types. 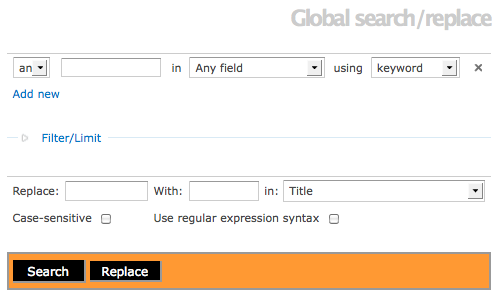 Global search and replace allows administrators to query the entire database and globally replace specific terms in each field: title, alternate title, scope and content, bio/admin history etc...(see drop-down for full listing). Holdings is a generic term referring to the records and other materials held by archival institutions. In ICA-AtoM a list of holdings is displayed in the context menu on archival institution view pages. The list is generated from the titles of archival descriptions that have the archival institution selected as a repository (see Context area). The home page is the first page the user sees when opening the ICA-AtoM application. It can also be accessed via the "Home" link on the user menu or by clicking the site logo. The content of the home page can be edited by administrators (see Manage static pages). Edit page showing information areas: Identity area, Context area, Content and structure area, etc. Information areas appear on edit pages and group related fields based on the organization of elements of description in ICA descriptive standards. Clicking on an information area toggles it between closed (all fields in that area hidden) and open (all fields visible). An information object is another term for an archival description. The language menu, located in the top-left corner of the page, allows the user to switch to any of the supported languages in ICA-AtoM. The current language is always underlined. See Choose language. In the Trillium theme, the language menu is located in the top-right corner of the page and is a drop-down list. The level of description is "the position of the unit of description in the hierarchy of the fonds" (ISAD glossary). In ICA-AtoM, the level of description is selected from a value list in the "Identity" area of an archival description. See Identity area. The main menu is the the navigational tool located near the top of all pages for authenticated users, right below the search box. It allows the user to navigate to all the main areas of ICA-AtoM. The master digital object is the unaltered version of a digital object that has been uploaded to ICA-AtoM. ICA-AtoM automatically generates a thumbnail and a reference display copy of the object. Only authenticated users may view master digital objects. See Upload digital objects. Media type refers to the format of uploaded digital objects. The media type is selected automatically by ICA-AtoM when a digital object is uploaded and the thumbnail and reference display copies of the object are generated. See Upload digital objects. Media type terms are controlled by the media type taxonomy. ICA-AtoM ships with five terms (audio, image, text, video, other) that are locked; these cannot be edited or deleted because they are referenced by ICA-AtoM's code. Editors and administrators can add new media type terms, but unless developers incorporate these into the code, the system will not be able to do anything with them. A multi-repository system exists when a single instance of ICA-AtoM is used by a network of archival institutions. Multi-value field showing three subject terms in an archival description. In ICA-AtoM, names are registered in authority records for corporate bodies, persons, and families who interact with archival materials as e.g. creators, custodians and publishers. Names can be applied as access points to archival descriptions. See access points. A network is an aggregation of institutions using one instance of ICA-AtoM to produce a union list of archival holdings (a multi-repository system). The page title indicates what kind of page a user is viewing; for example, it indicates whether accession records, archival descriptions, authority records or archival institutions are being displayed in a view page or an edit page. The parent record refers to the description of the archival unit that is one level of description higher than the current unit. For example, a fonds may be the parent record of a series. Passwords are required by every user of the system who needs to be able to add, edit, or delete content. The initial passwords are set by the system administrator (see add a new user) and can subsequently be changed by the user (see Change password). In ICA-AtoM, a place is a geographic location registered in a taxonomy and used as an access point in archival descriptions, authority records, and archival institutions. Physical storage is a grouping of fields relating to the management of physical objects such as folders, boxes, shelves, and cabinets. 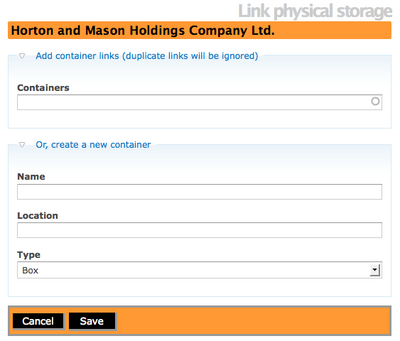 In ICA-AtoM, users can create and edit information about physical objects by clicking on the "Link physical storage" button in the button block of an archival description. See Physical storage. An icon of a printer is located in the title bar of the View Physical storage and Search/Advanced Search results screen. A published record is an archival description that has had its status changed from draft to published in the gray box at the bottom of the archival description edit page. The status is inherited from the highest level of description; e.g. when a fonds description is changed from draft to published, all child records within the fonds are automatically changed as well. Once archival descriptions have been published, users who are not logged in can view them. The International Council on Archives (ICA) defines a record as "recorded information in any form or medium, created or received and maintained, by an organization or person in the transaction of business or the conduct of affairs" (ISAD glossary). The Society of American Archivists (SAA), which maintains an excellent glossary of archival terminology, holds several different definitions of a record, including: "data or information in a fixed form that is created or received in the course of individual or institutional activity and set aside (preserved) as evidence of that activity for future reference." In ICA-AtoM, an archival description is used to provide contextual information about and intellectual control over archival materials, which include records. A reference display copy is a low-resolution version of a master digital object generated automatically by ICA-AtoM on upload. It is used to display images on the digital object view page when the user clicks on a thumbnail and in the digital object area of edit pages. See Upload digital objects. In ICA-AtoM a report icon can be found in the title bar of the View archival description screen. Clicking on the report icon takes the user to a Reports screen and the choice of printing 3 different reports: File list, Item list or Physical storage locations. A researcher is a type of user who is limited to searching and browsing descriptions. See User roles. The search box is used to find descriptions in ICA-AtoM that contain text matching a search query. The search box is located over the main menu on all ICA-AtoM pages, including the home page. See Access content. Settings is a broad term used to describe the properties that affect the way a program looks and functions. In ICA-AtoM, certain settings can be changed by an administrator in order to customize ICA-AtoM to institution-specific requirements. See Settings. 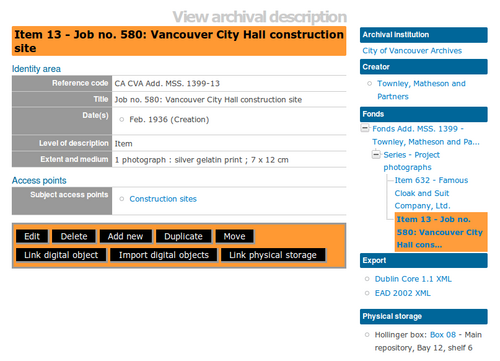 Site description reading "Historic Archives of the District of New Caledonia, British Columbia". Note use of Columbia theme (see Themes). The site description appears at the top of the page directly under the site title. It is a configurable element - the text can be changed or removed (see Themes). The site logo is the graphic that appears at the top of all pages in ICA-AtoM. Clicking on the logo will take the user to the home page. ICA-AtoM ships with a default logo that can be replaced by administrators to theme the application to their own institution or network if desired: see Site logo. Site title reading "New Caledonia Archives". Note use of Columbia theme (see themes). The site title appears at the top of the page next to the site logo and over the site description. It is a configurable element - the text can be changed or removed (see Themes). Simple Knowledge Organization System (SKOS) is a data standard model developed by the World Wide Web Consortium (W3C) as a common data model "for expressing the basic structure and content of concept schemes such as thesauri, classification schemes, subject heading lists, taxonomies, folksonomies, and other similar types of controlled vocabulary." (W3C SKOS Primer, 18 August 2009). It is used in ICA-AtoM to import and export hierarchical taxonomies. See: export descriptions and terms. Static pages are pages that are designed to look the same each time they are accessed, in contrast to dynamic pages such as search results, view pages, or edit pages. ICA-AtoM has two static pages, the home page and the about page. Static pages can be edited by an administrator (see Manage static pages). In ICA-AtoM, subjects are controlled-vocabulary terms grouped in a taxonomy and used as access points in archival descriptions. In ICA-AtoM, a supported language is one into which both data elements and user interface elements can be translated. In ICA-AtoM version 1.0 beta, the supported languages are Arabic, Dutch, English, Farsi, French, German, Greek, Icelandic, Italian, Japanese, Korean, Portuguese, Spanish and Slovenian. ICA-AtoM 1.3 and AtoM 2.0 support additional languages of Thai, Indonesian, Galician, and Catalan. A taxonomy is a grouping of controlled-vocabulary terms used to generate value lists and access points. See Add/edit terms. Terms are the values that make up controlled vocabularies. In ICA-AtoM, terms are grouped into taxonomies that can be added, edited, and deleted through the "Term" item of the add menu. See Add/edit terms. A thumbnail is a small, low-resolution version of a master digital object generated automatically by ICA-AtoM on upload. Thumbnails are displayed in search and browse results and in cover flow views at higher levels of description. See Upload digital objects. Title bar in an archival description show page reading "Fonds PR-84 - New Caledonia City Clerk fonds"
The title appears at the top of archival descriptions, authority records, and archival institutions and functions. Tooltips are online text designed to assist users to enter data in edit pages. Tooltip text is derived from the standards on which the edit templates are based. Note that administrators can tooltips on or off issue 2338 - see Global settings. The translation bar appears at the bottom of the page when users with translator access privileges select a language from the language menu. Clicking on "Translate user interface" in the bottom right-hand corner of the bar opens up the translation panel, where the user translates user interface elements. See Translate interface. A translator is a type of user who can translate data elements and user interface elements. See User roles. User accounts are established in order to manage access privileges through the assignment of user roles. Every user who must be able to add, edit, delete, or translate content must have a user account. In ICA-AtoM user accounts are established and maintained by administrators. See Manage user accounts. The user interface is the set of elements that allow the user to interact with the ICA-AtoM application. These elements include the main menu, drop-down menus, context menu, title bar, column headers, buttons, fields, and field labels, and any other elements used to navigate ICA-AtoM or to search for, view, add, edit, and delete database content. The labels of some user interface elements can be customized by administrators (see User interface labels). The user menu, located in the upper right hand corner of the page, contains basic navigational links. These allow the user to go to the home page and about page, user documentation (help pages) and the log in page. Authenticated users can also use it to navigate to their user profiles. The username is a name supplied by an administrator to any user (other than a researcher) of the ICA-AtoM application as part of the user account. See Manage user accounts. A user profile is information about a user managed in a user account. User profiles are created and maintained by administrators (see manage user accounts), although authenticated users can view their own profiles (and change their passwords) by going through the user menu. User roles define levels of access to functions in ICA-AtoM, ranging from view-only access to full administration rights. User roles are defined by groups that an administrator can add and edit. See User roles and Add a new group. View mode provides read-only access to the contents of archival descriptions, authority records, functions and archival institutions using view pages. In view mode, ICA-AtoM displays only those fields in a record which contain data. Visible elements introduced in Release 1.3 enables the Administrator to "hide" specific fields in the database from the public (i.e., unauthorized users). To review which fields can be hidden from view, select ISAD template, RAD template, Digital object metadata area, and/or Physical Storage. The Administrator can click on the checkboxes to reveal the field, and an unchecked box hides the field. This page was last modified on 27 January 2014, at 18:03. This page has been accessed 434,157 times.